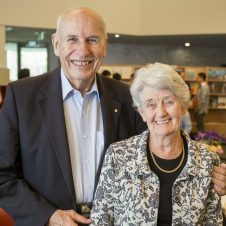 Curtin University has recognised Dr John O’Sullivan’s ground breaking work in astronomy and wireless technologies by bestowing him with an Honorary Doctorate of Science. 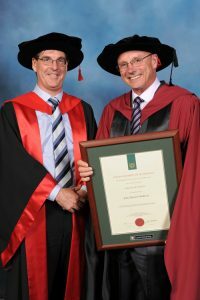 The award was presented at a graduation ceremony at Curtin Stadium on 25 September. Dr O’Sullivan helped to create the technology behind WiFi networking, revolutionising the way the world uses computers. The discovery effectively cut the cables that tied computers to the desk and is now found in millions of laptops, printers and games. The technology is now built into the next generation of mobile phones and is set to transform how we interact with our cars and homes. It was while Dr O’Sullivan was searching for radio waves from exploding black holes in the early 1990s that he and his team at CSIRO discovered how to reduce the interference created by radio waves bouncing off structures. He and his team devised a computer chip that cleared up the fuzzy signals, allowing wireless networks to operate five times faster than was previously possible. Dr O’Sullivan is Ajunct Professor of Radio Astronomy Engineering at Curtin and is involved in ICRAR’s engineering activities. He was also recently elected a Fellow of the Australian Academy of Science. In 2009, Dr O’Sullivan was awarded the nation’s top science award, the Prime Minister’s Prize for Science for his work on the network and astronomy. A senior research scientist with CSIRO Astronomy and Space Science (formerly ATNF) and former Deputy Chief of the CSIRO Division of Radio Physics, he was also awarded the CSIRO Chairman’s Medal in 2009. In 1995, Dr O’Sullivan joined the business sector, working with Rupert Murdoch’s media empire News Limited as its global technology director, guiding the rollout of satellite, pay and digital television. In 1999, Dr O’Sullivan worked as a consultant before becoming the Chief Technical Officer with Radiata Communications – a CSIRO/Macquarie University spin-off company that commercialised a chip using the wireless LAN patent. 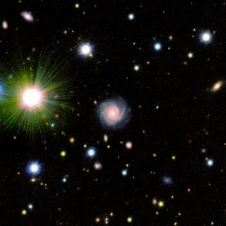 After a decade in the corporate sector, Dr O’Sullivan returned to what he loves best – solving complex problems at the interface between astronomy and engineering. Dr O’Sullivan is now working on the $3 billion dollar international project to design and build the Square Kilometre Array (SKA), which may be built in Western Australia. Curtin University Vice-Chancellor Professor Jeanette Hacket said the award recognised Dr O’Sullivan’s enormous contribution to radio astronomy engineering and his seminal role in the invention of WiFi technology. “Dr O’Sullivan has made a substantial contribution to the field of radio astronomy over the past 35 years, by providing a high level of international engineering leadership,” Professor Hacket said.